“The Hammer” is a San Diegan who moved to Nashville in 2013. He is on the board ofFarmOne.org, a nonprofit sustainability farming organization that works to empower people to become self-sufficient food producers. TAOVBB: How did you get to Nashville from San Diego? The Hammer: I got involved in sustainable farming in California, and I wanted to expand my understanding in a different location, and I ended up here in Nashville. I help run a farm in White’s Creek, as well as give seminars and workshops for students and communities on how to grow their own food and rely on the grocery store less. TAOVBB: That sounds like it ties in really nicely with the ideals of Vintage Base Ball. The Hammer: I think it absolutely does. It’s a return to the roots of what we see today. Instead of going to the grocery store and buying fruits and vegetables, people are able to grow their own food and experience the ownership, responsibility, and empowerment of producing food themselves. 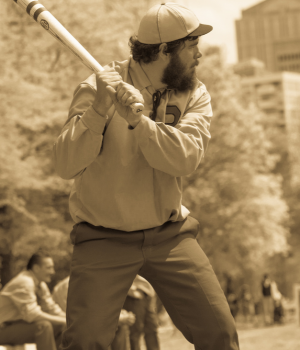 In Vintage Base Ball, people are able to experience firsthand where modern baseball comes from, and see how the game is similar and different all at the same time. For the ballists, we get to care for the game, both the modern and vintage versions, and feel the same empowerment that the farmers feel. 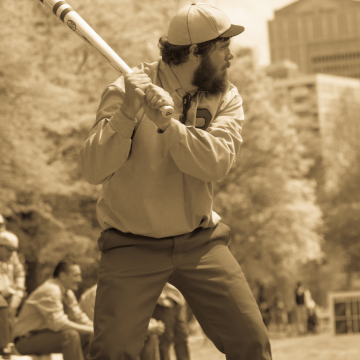 TAOVBB: What makes Vintage Base Ball special? The Hammer: There’s a unifying thread that connects all the ballists together. We have a unique responsibility to the game and to each other to promote the vintage game, and to help the fans see what we see in it. That thread connects all of us in an oddly profound way; when you meet another ballist, there’s already a connection. It’s a pretty amazing experience.